The occipitoatlantal (O-A) joint is the uppermost weight-bearing synovial joint in the body and is the final junction for adapting to asymmetry or dysfunction from below. Mechanically, the head teeters on the two condyloid joints (shaped like cupped palms tipped slightly medially) that make up the O-A joint. This design allows the head to nod back and forth and side to side. Since the O-A joint surrounds and attaches to the brain stem, which controls all basic body functions (including breathing and heartbeat), poor alignment may have widespread consequences. 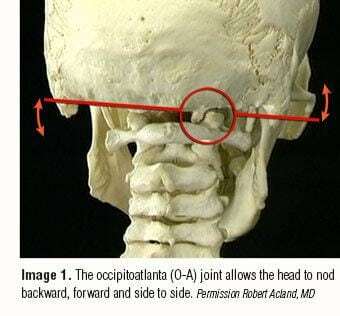 For example, if the O-A joint on one side develops a restriction, the crooked occiput may set off local neurological reflexes that increase muscle tension in the suboccipitals, and which may compress and irritate the greater occipital nerve (Image 1). 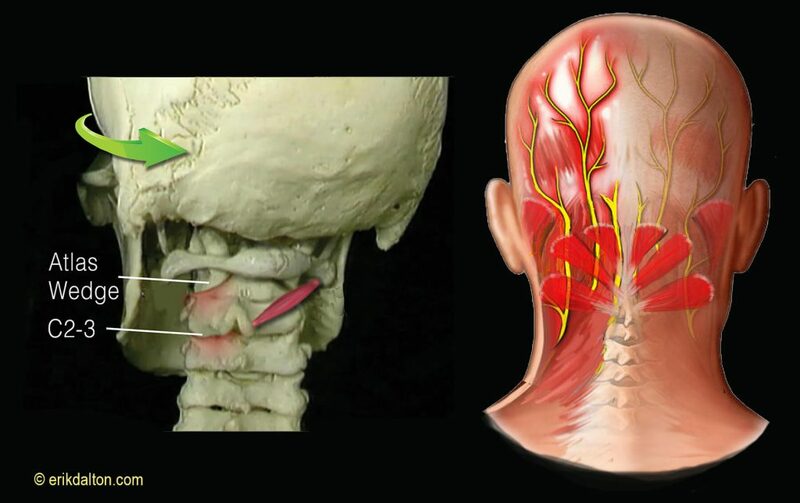 Clients presenting with occipital neuralgia commonly complain of pain referring up the back of the head and around the side, sometimes reaching into the orbital region. These headaches usually result from holding an awkward, static head posture. Prolonged, non-neutral postures with the head tilted on the neck can cause mechanoreceptor excitability in surrounding muscles, ligaments, and joint capsules as the O-A condyles are crammed closed on one side. Examples might include a plumber who works under a sink with his head cocked to one side or an office worker who secures a telephone with her shoulder and chin. Clients whose computer monitors sit either too high or too low may develop bilateral O-A restrictions leading to global head pain. Following the client history intake and palpation of suboccipital hypertonicity, the MAT therapist must try and determine the origin of the suspected occipital neuralgia headache. Ask yourself this question first: Is the unlevel O-A joint and accompanying suboccipital spasm the result of awkward head and neck positioning, as in the case of the plumber under the sink, or could there be compensations below contributing to the reflexogenic spasm and greater occipital nerve compression? One way to help solve this mystery is to perform a Brugger Test. With your left hand bracing the client’s forehead and the index finger and thumb of your right hand gently palpating and holding the area with the most knotty suboccipital spasm (Img. 2). Continue to hold this hand position and ask the client to sit. If the spasm decreases when the client sits, this suggests asymmetry somewhere in the lower body is forcing compensation at the O-A joint. A functional short leg, unlevel pelvis, or rotoscoliosis are examples of common postural faults that must be addressed before dealing with the fixated O-A. If the suboccipital spasm stays knotty when both standing and sitting, it’s an O-A problem and not compensation further down the kinetic chain. Begin by applying your favorite suboccipital technique to release the protective muscle guarding. Once the suboccipital hypertonicity has calmed, assess and correct O-A joint hypomobility by sliding the right hand under the supine client’s head while your left palm secures the forehead. Without lifting the client’s head, ask for a slow chin tuck toward the chest. As the head begins to flex on the neck, follow this movement with your right hand by softly pulling the back of the head superiorly, while the left hand gently pushes the forehead toward the eyebrows—imagine rolling a bowling ball using two hands (Img. 3). By applying a gentle two-second overpressure at the end of this chin tuck maneuver, you should be able to assess the ability of the occipital condyles to glide back on the atlas. If there is restriction to the chin tuck (i.e., a hard restrictive barrier), the O-A is unilaterally or bilaterally restricted. To determine which side is stuck, simply right-sidebend the client’s head 20 degrees and repeat the chin tuck technique. If no resistance is encountered, test the opposite side by left-sidebending 20 degrees and rolling the head into flexion. If the chin does not want to approximate the chest with the head in this position, then the right occipital condyle is stuck anteriorly and is unable to glide back on the right atlas condyle. If the client’s pain is also on the right, the fixated right condyle is likely the main event causing occipital neuralgia. To free the soft tissues that are restraining joint motion, keep the client’s head in the same left-sidebent position and ask for a chin tuck while your hands follow with two seconds of gentle overpressure at the end range of flexion (stop if the client experiences any discomfort). Repeat three times and retest with the head in a neutral position. Your clients will love this gentle myoskeletal O-A stretch and appreciate relief from the nagging, and sometimes debilitating, pain of occipital neuralgia. 1. Postacchini F, Massobrio M, Idiopathic coccygodynia. Analysis of fifty-one operative cases and a radiographic study of the normal coccyx. The Journal of Bone and Joint Surgery. 1983 65(8): 1116-1124. 2. Kim NH; Suk KS: Clinical and radiological differences between traumatic and idiopathic coccygodynia. Yonsei Med J, 1999 Jun, 40:3, 215-20. 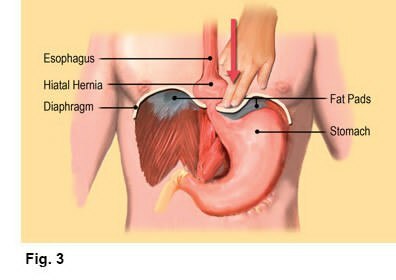 Check out the Posture, Pain, Performance home-study program.